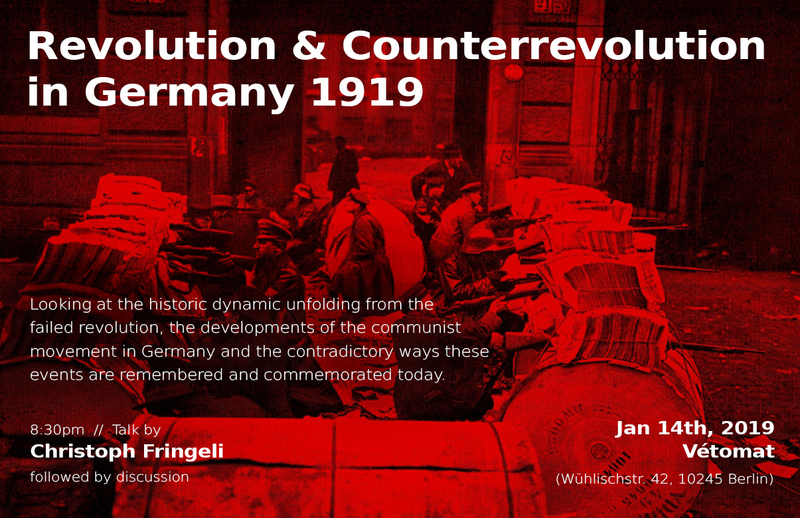 Our new series of talks, discussions and presentations brought to you by Datacide and next:now is going into its fourth round on January 14th, 2019 with a talk about Revolution and Counterrevolution in Germany 1919 and beyond, by Christoph Fringeli. On January 15th, 1919, communist revolutionaries Rosa Luxemburg and Karl Liebknecht were murdered in Berlin. They were only the two most prominent victims of the counter-revolutionary white terror that followed the attempts at a socialist revolution in Germany after World War I. Only two weeks earlier they had been involved in the foundation of the Communist Party of Germany (KPD). It was at a crucial moment of the revolutionary development that had forced the Kaiser to abdicate and saw workers and soldiers returning from the battlefield to set up workers’ councils. The biggest of the workers parties, the Social Democrats (SPD), created a coalition with centrist bourgeois parties as well as with the military and the proto-fascist Freikorps fighters, who they used to squash the uprising rather than supporting the radical changes demanded by their base. CF will look at the historic dynamic unfolding from the failed revolution, the developments of the communist movement in Germany and the contradictory ways these events are remembered and commemorated.